How best to cap a round at a Top 100 course than to repair to the locker room for a hot shower and a cold beer? Here are the three best locker rooms at Top 100 Courses in the U.S.
"The men's locker room at the Seminole Golf Club is long and airy…with a ceiling thirty feet high," wrote Sports Illustrated's Dan Jenkins in 1965. "The décor includes thick gold rugs, cypress clothes closets with intricate designs carved on the doors, overstuffed sofas and chairs, a fireplace, a small bar and the heads of fifteen wild animals, which stare down from the walls. It is quiet, pleasant and elegant—one of the better places in Florida to change your shoes." Little has changed in 51 years. It's why Seminole's locker room remains the consensus number one. An early (circa 1967) Pete Dye masterwork graces this low-key, private men's club in suburban Columbus. The Golf Club's symbol, a majestic stag head with a 12-point rack, adorns one wall of the paneled locker room, but it's the north wall, and its Cotswold stonework fireplace, that commands your attention. Affixed to the 15-foot oak mantel are the brass locker nameplates of deceased members. Above the mantel is a portrait of the late club founder (and benevolent dictator) Frederick E. Jones, who gave Jack Nicklaus his first job, as a life insurance salesman, when Nicklaus was enrolled at Ohio State. "My hometown of Columbus," Nicklaus said, "is blessed with several exceptional golf courses." And a damn sweet locker room, too. 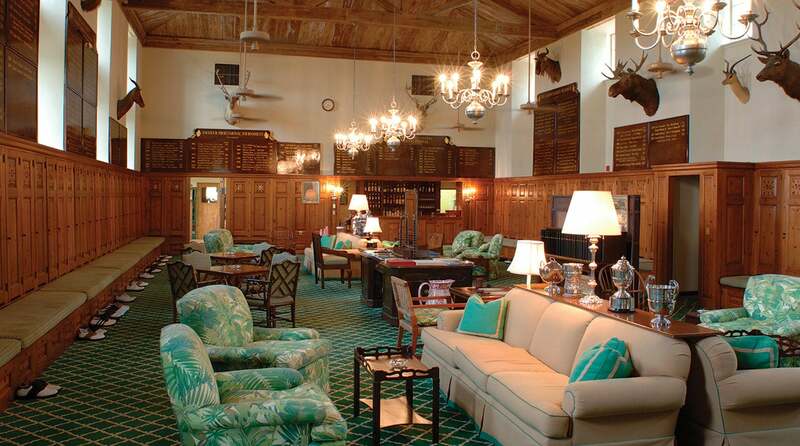 The legendary primrose-yellow clubhouse usually attracts the bulk of the attention at The Country Club, but its next-door, stand-alone, brick locker-room building is equally special—and a veritable time capsule. Its balcony is where the victorious, champagne-swigging, 1999 U.S. Ryder Cup team gathered to greet cheering fans below. The bar seems lifted from a 19th-century law library and is surrounded by ancient photos, many dating to Francis Ouimet's stunning upset of the Brits at the 1913 U.S. Open. You'll also find a copy of the charter that, in 1894, created the United States Golf Association. Even the towering urinals and tall windows recall a prehistoric age in golf.